It’s 21×21, but you can call this puzzle “plus sized” if you want! THEME: Common sizes (S, M, L, or XL) are added to clothing items and reimagined wackily. 23A [Trousers worn while having a nip of vodka?] SHOT PANTS. 30A [Denim garment worn by author Judy?] BLUME JEANS. 37A [Blazers worn while ringing church bells?] PEAL JACKETS. 59A [Outdoor garments worn while checking the inventory at Madame Tussauds?] WAX LIST COATS. 81A [Business attire worn while making a sudden leap for cured salmon?] LOX LUNGE SUITS. 99A [Footwear worn by an amoeba?] BLOBBY SOCKS. 112A [Dress bottom worn by an editor of a men’s magazine?] MAXIM SKIRT. 122A [Summer wear worn by one who reeked?] STANK TOPS. 67A and 76A […attire worn by some models, and an alternate title for this puzzle] PLUS SIZE CLOTHING. I thought for certain this was an “add a letter” theme where the added letters would spell something clever once solved. But as I traveled southward in the puzzle and tried to figure out the hidden message, I had SML??LM??. I was pleasantly stumped. It didn’t help that I had spelled BLUME incorrectly (Bloom). And although I had P? ?SSI?E CLOTHING, I just couldn’t see PLUS SIZE. Once the revealer fell into place, it made a heck of a lot more sense, and it explained that two letters (XL) were added to a couple of base phrases. Aha moment! My favorite entries were BLOBBY SOCKS and STANK TOPS. Although I’ve never heard of BOBBY SOCKS, it was inferable and there’s something very enjoyable about the resulting BLOBBY SOCKS. Say it aloud. Go ahead. Fun, right? STANK TOPS feels grammatically off with the clue [Summer wear worn by one who reeked?] though I can’t pinpoint why, but I still find it to be one of the more colorful theme answers. Does anyone call them PEA JACKETS? Google seems to think that they’re more often referred to as PEA COATS, but alas COATS was claimed by another theme answer and PEA JACKETS is enough of a thing to pass. Adding XL must’ve been the toughest part for Evan to come up with as those yield the most absurd entries: WAX LIST COATS and LOX LUNGE SUIT. The ANTIFA, FIAT, MAJA crossings were tricky for me. If FIAT were clued as the car, I probably wouldn’t have had to run the alphabet in order for Mr. Happy Pencil to make an appearance. 55A [Like a full-moon viewing?] OBSCENE. It’s been a while since I’ve taken part in or seen a good ol’ fashioned mooning. 4D [Asp holes] SNAKE PITS. Perhaps you thought this clue was OBSCENE? Get your mind out of the gutter! 15A [Sandwich sign-off] TATA. “Sandwich” being the historic town in Kent County, England. 47A [NFC participant in Super Bowl LIII] L.A. RAM. Despite having watched this punt-fest only a week ago, I paused for quite a while trying to remember who played the Patriots. 119A [Police station?] ARENA. As in the band, not the actual police. 3.8 Stars from me. I liked the bite and the unexpected revealer that helped me understand the theme. P.S. I’m just noticing now (after making added letters red in the theme answers) that the sizes go up then down symmetrically! S M L XL XL L M S. Cool!! I was out to dinner a couple hours after the puzzle came out, and figured I should get started on the puzzle on my phone. Remind me not to ever solve a 21×21 puzzle on my phone! I was genuinely astonished that I didn’t have a bunch of typos at the end, because I had caught and fixed maybe 25 of them as I went along. No idea how the puzzle really is on the difficulty spectrum. Anyway! At least the app highlights the theme for me so I don’t have much to explain. The blue revealer is FIVE TIMES FAST, and really, my tongue twister requirements are just to say it three times fast. The yellow themers are THREE FREE THROWS (I can’t say it 3 times), REAL RARE WHALE (can’t say 2x), SHOE SECTION (2x), UNIQUE NEW YORK (1x), IRISH WRISTWATCH (1.5x), and SHE SEES CHEESE (1.5x). 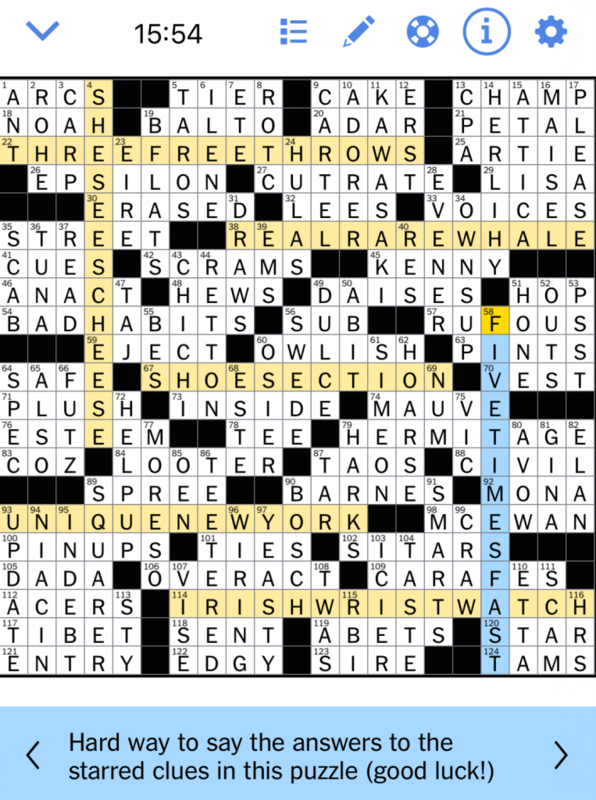 I hadn’t really seen the puzzle title before I started the puzzle, so it took me a while to grok the theme. I tell ya, FIVE TIMES FAST is excessive! Please let me know if you can wrangle that with any of these tongue twisters. There wasn’t much spice in the non-theme fill. I did like BAD HABITS and KAWASAKI. ADORER, EVENER, and SQUARER were a bit jarring with the awkward -ERs, though. Did not know: 79a. [Andrew Jackson’s Tennessee home, with “the”], HERMITAGE. There’s a Chicago street by that name, along with the cultural institution in St. Petersburg, Russia. 57a. [Reddish], RUFOUS. I sort of flailed here, taking a stab at RUBOSE and RUBOUS (which might not be words at all). 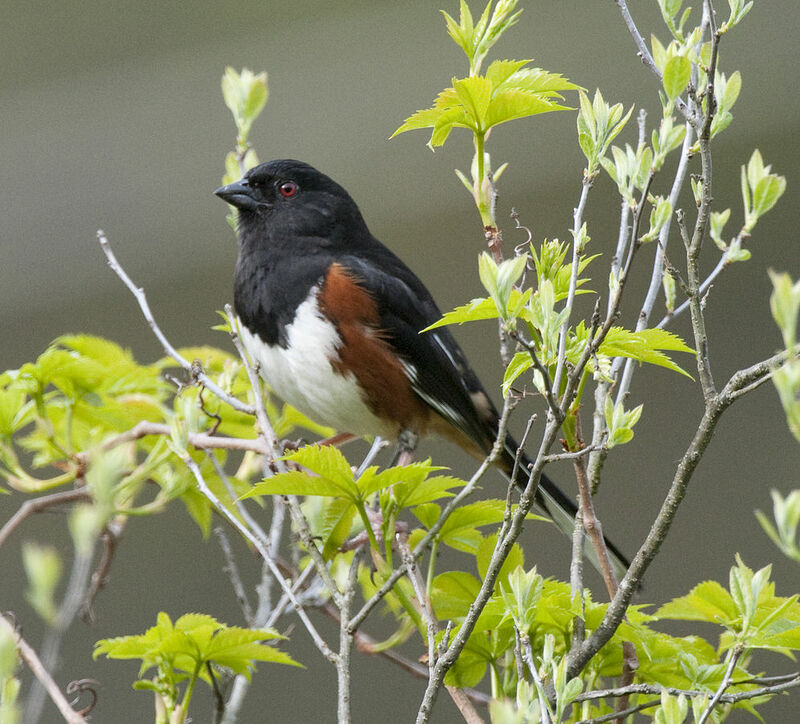 I’d have done better with a fill-in-the-blank bird, though apparently the rufous-sided towhee has been subdivided into two different birds now. I think the Eastern towhee is the one my family spotted once. 4d. [*What a dairymaid does all day long], SHE SEES CHEESE. I can’t help thinking that the women who work at or own dairy farms are really not keen on the terms dairymaid and milkmaid. 6d. [Chaiken who co-created “The L Word”], ILENE. I knew where the N belonged but forgot the rest. Which I shouldn’t have, because it’s also the name of my BFF’s mom! Anyway, if you’re a fan of The L Word (the erstwhile Showtime drama featuring lesbian characters), keep your eyes out later this year for the sequel’s 8 episodes. 8d. [Source of a deferment in the 1960s draft], ROTC. (No abbreviation cue in the clue, oddly.) And here I was thinking the answer would be HEEL, or SPUR. 14d. [Tim ___, frequent collaborator with Adam Sandler], HERLIHY. No idea who this guy is, and knowing pop culture is part of my job. Apparently he’s the most famous HERLIHY available at this time? 39d. [Leading characters in “Mad Max”], EMS. Characters typographically speaking, not dramatically. Not a fan of plural spelled-out letter entries. 69d. [Book before Deut. ], NUM. I prefer NUM as an interjection along the lines of yum and (the one I don’t like) nom. 8d [Little shop champion (see letters 2, 3, 5, 6, 11 and 18)] SMALL BUSINESS ADVOCATE–I actually spent some time here, not much, trying to remember characters from The Little Shop of Horrors. Editor David Steinberg has notified constructors that there cannot be circles in the grids of Universal puzzles, but that he was prepared to do “work-arounds” where appropriate and feasible. So, here is a work-around. 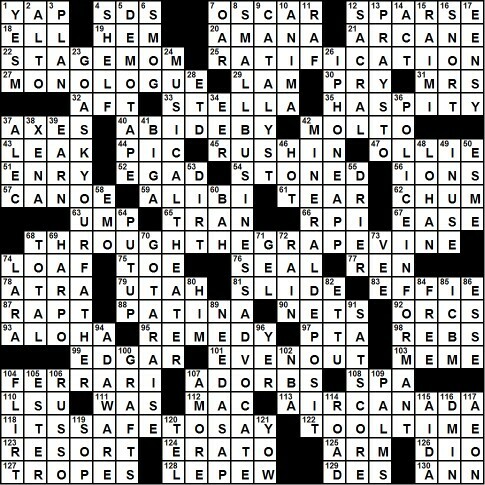 Rather than gleaning what’s on these vines via circled letters or shaded squares, one must count within these vertical answers to come up with MALBEC, SYRAH, MUSCAT, PINOT, and MERLOT–types of grapes. The price for such an array? Thirty-eight 3-letter answers, plus a modicum of semi-clunkers such as YER, ET TU, ESSE, & ESME. But these did not distract me or detract from the enjoyment! 10d [Test for some IRS workers] CPA EXAM–First-timer, this, I believe. 47d [Account checker] AUDITOR–Intriguing mini-theme, as tax-time nears. I like today’s LAT better than the NYT, which is a fairly low bar. I enjoyed the LAT theme and wasn’t deeply distressed by the fill. 23a [Chef’s directives involving sieves?] is STRAINING ORDERS. Do I need to tell you the base phrase is reSTRAINING ORDERS? No? I didn’t think so. 34a [One splitting firewood?] is CORD BREAKER. 43a [Chance for Obi-Wan to play?] is TURN OF THE JEDI. Alternate clue: [Henry James/George Lucas collaboration]. 69a [Therapist’s technique using poetry?] 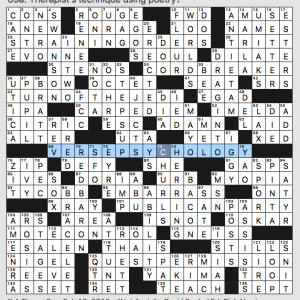 is VERSE PSYCHOLOGY. 111a [Dusting goal?] is MOTE CONTROL. 125a [License to search for the Holy Grail?] is QUEST PERMISSION. I know I’ve been working too much when my first thought is QUEST Labs. 4d [TV dinner brand] is good ol’ SWANSON. I was always torn when it was TV dinner time in our house. I liked the turkey and stuffing but not the dessert that came with it; as I recall, the brownie came with the meatloaf. Choices, choices. 13d [Bloody Civil War battle site] is ANTIETAM. According to Wikipedia, the Battle of ANTIETAM set the carnage mark not only for the Civil War but for all of American history, with 22,717 dead, wounded, or missing in one horrendous day. 38d [Benjamin of “Law & Order”] is BRATT. I am a Law & Order purist: only the original, and ideally with BRATT and Jerry Orbach. No substitutes accepted. 50a [YOLO, in ancient Rome] is CARPE DIEM. Seize the day so you don’t have FOMO. 74d [It’s misleading when it’s red] is HERRING. My dad once wrote this in a patient’s chart: “The anemia is not the cause of symptoms. It’s a pink herring.” He enjoyed that so much that he called to tell me about it. We doctors are weird. What I didn’t know before I did this puzzle: I’d never heard of ONI, the Office of Naval Intelligence. They’re the second hit on Google after the demons or trolls found in Japanese folklore. This entry was posted in Daily Puzzles and tagged Andrea Carla Michaels, David Poole, Evan Birnholz, Jim Quinlan, Lee Taylor, Mark Diehl. Bookmark the permalink. 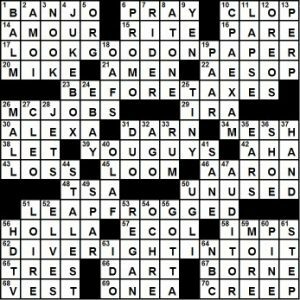 Universal: I just wondered if the links on the Today’s Puzzles page for the Sunday Universal Crossword are correct. My understanding was that the David Steinberg-edited Sunday grids were print only–even though Jenni and I found ways to print them for the first two Sundays. The puz link is in error and goes nowhere. The HTML link just opens the webpage for the daily puzzle. I’d appreciate any info. Thanks. I’m pretty sure the link will work when the puzzle goes live, which is (I think) midnight central time. Yep, midnight Central for the Sundays. The dailies appear a few minutes after midnight Eastern. David provides me the Across Lite version of the Sundays directly. Thanks so much, Jim Q and Martin. I’ll have to remember this next Saturday night. What is nice to realize is that there will be two Universal puzzles on Sunday–the Sunday-sized one and the daily-one. Uh, I can vouch for Judge Vic’s write-up of the Universal 21x being at WordPress, ready to post since well over 24 hours ago. NYT seemed forced & inconsistent. Phrases you’d never actually use except SHOE SECTION & maybe THREE FREE THROWS. All but one of them were 3 words. All but one of them (excluding the revealer) were across. Another Sunday that perhaps could have done with less theme & a stronger fill. I agree that the NYT theme was not amusing, making the whole puzzle ride on some of the odd fill that Amy singles out. She’s right, too, that the usual phase is “three times fast,” and I couldn’t help wondering whether it changed to FIVE for length in the grid or just to avoid the awkward overlap with THREE in another theme answer. Either way, blah. Since when are tongue twisters considered to be ‘in the language’ as regular phrases? That said (one time), I wasn’t particularly wowed by the puzzle per se either. Consistency is the point. If they’re all going to be not in the language, and the motif will be cluing nonsense tongue-twisters, fair enough. It’s the mix that’s unsettling. Small nit – a basketball player only gets 3 FTs on a missed 3-point attempt when fouled. If it goes in, it’s one free throw, for a potential 4-point play. The BALTO/ILENE crossing was unreasonable, I thought. Could easily be R. Not only that, but if you’re unfamiliar with music, you might wonder whether A sharp is equivalent to B flat or G flat. It took me a while to puzzle out the SW corner — mainly because I was expecting [placename]NEWYORK and accepted UNIQUE reluctantly. I agree. I had to look up Chaiken. I agree with Amy regarding the casual paternalism of the nomenclature, and I suspect it was used (a) specifically to get at the gender in the answer and (b) without a thought by either the woman constructor, the men editors, or the mixed group of test-solvers. Milkmaid and dairymaid are just SO in-the-language–been around since the 1500s! That said, (a) there is no reason why cruciverbalists should not metaphorically don extra-sensitive antennae for this type of thing and seek new solutions and (b) this clue-answer combo is, imho, but one more item in a convention (I hope that is the right word) that has been seeping into crosswords for the past 2-3 decades, by my imprecise calculations. It is a convention that I am generally averse to, as it seems to break a long-standing rule or tradition that the answer to a clue should be one item. Not one word necessarily, not at all, but not a clause, dependent or independent, that serves as a conversational answer. 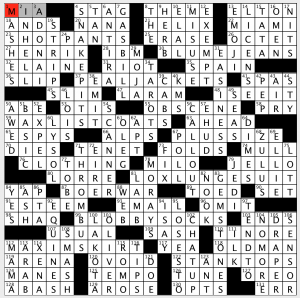 For the clue in point, [What a dairymaid does all day long], the one-thing answer should start with a verb–SEES CHEESE, HANDLES UDDERS, HANGS TEN, etc. This comment is already too long, so I’ll give an exaggerated other example. [Purchase from Sajak] AN I. Obviously, I is the answer–or VOWEL could be. Another example of this is the clue [What there “oughta be”]. Okay, the soap box goes back into the closet. WaPo: The extra symmetry of the theme answers is such a great touch. I haven’t developed much construction chops (yet?) but that had to add substantial time investment for Evan. Evan – this was (as usual) lots of fun. But don’t expect any road signs in the U.K. in kms – they’ve been using miles since the Romans left! The Universal Sunday “workaround” is not very successful, in my opinion. Sure, I can go back and count down through the theme answers to find the hidden words, but it was of absolutely no help in the solve, and was invisible until after the fact. Circles would have been much more effective for this kind of theme. Why the prohibition? I couldn’t agree more. I counted one out and then stopped. Circles or shaded squares would have made the solve much more pleasant. Circles or shading are not possible due to Universal syndication limitations. David left the Across Lite file like that for consistency. I thought the thief Timothy Parker was the editor of the Universal crossword. His name still appears when I click on it at the Seattle PI. Is that not the case anymore? No that is definitely not the case. David Steinberg is current editor. Doh! I missed a year of puzzles. Still can’t figure out “Unique New York”….Help! Okay…I get it. Tongue twister, not a “real” place. Duh!